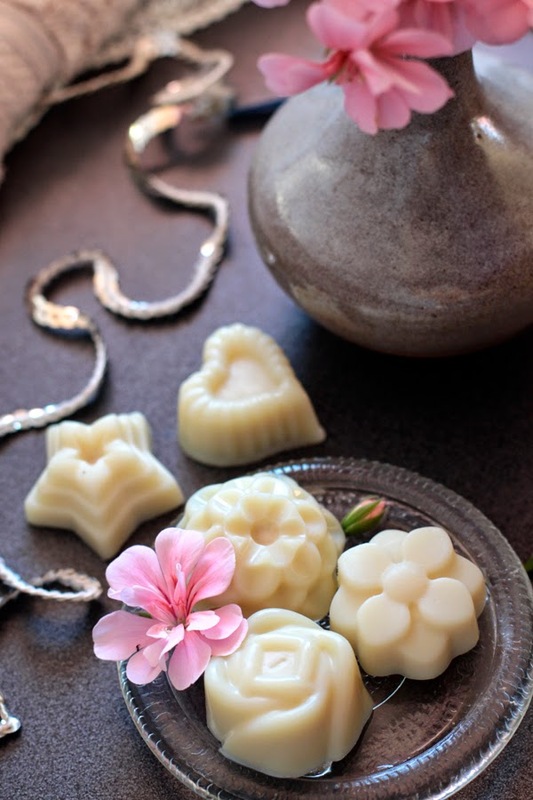 (The cocoa butter has a naturally rich chocolate aroma which would go well with Rose, Sweet Orange, Peppermint, Lavender or even Grapefruit oils. Chocolate or vanilla would both be great fragrance options too). The links above are for products on Amazon available in the US. 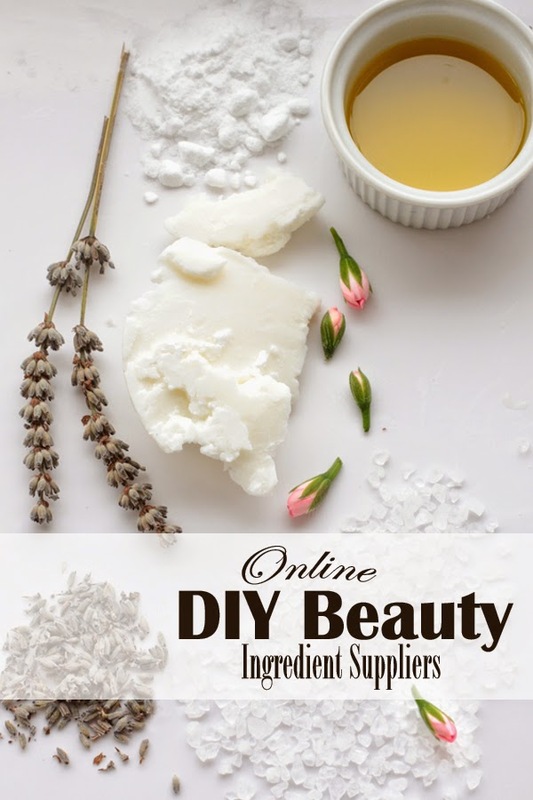 I’ve put together a list of more international online suppliers for these ingredients if you have any trouble sourcing them. I used these ones, if you’re in Australia they currently have them at the Reject Shop. I’ve also seen them on ebay too. I really like these Rose and Daisy ones too. 1. 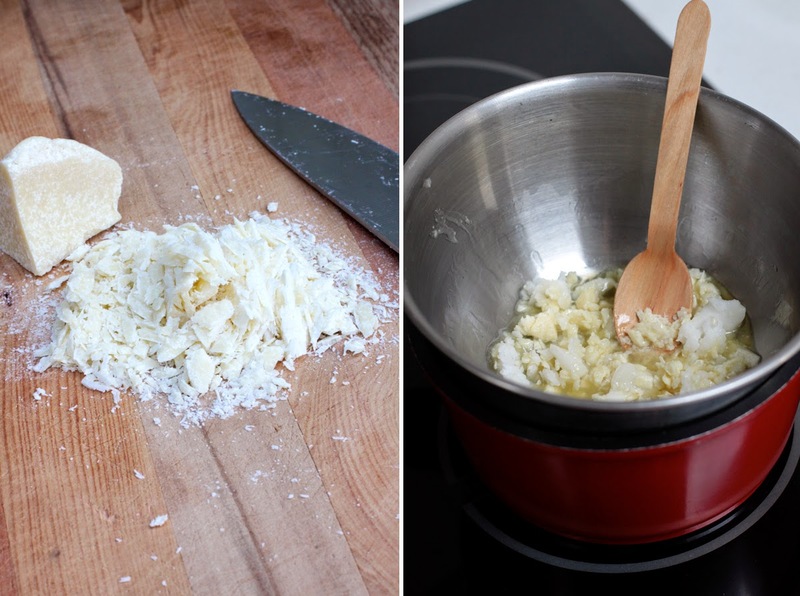 Shave cocoa butter into small pieces and flakes using a large, sharp knife (or you could use a grater). 2. Bring about 1 1/2 cups of water (1″ depth of water or so) to boil in the saucepan and let it simmer at a low temperature. 3. Place the cocoa butter and coconut oil in a bowl over the saucepan and stir until melted. I like to prop the bowl up on a spoon so steam can escape easily from the side. 4. Take the melted oils off the heat and add the essential oil (if using). 5. 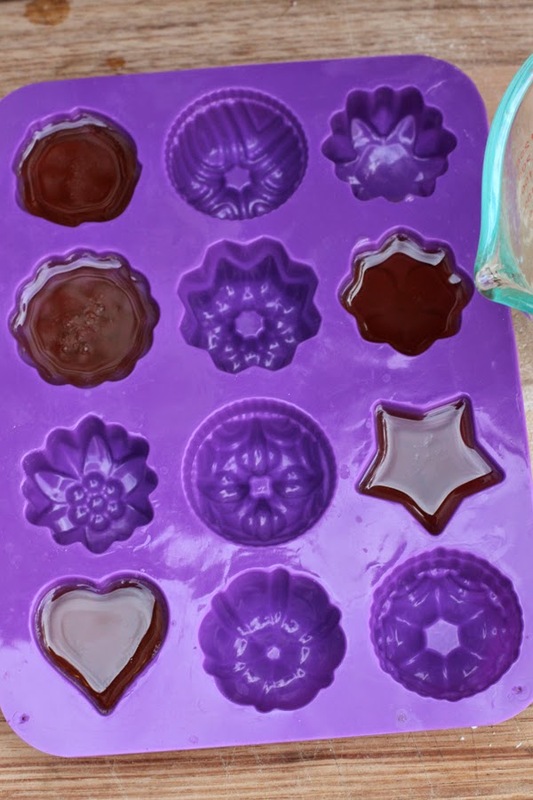 Pour into moulds and let them set in the refrigerator for a few hours. 6. 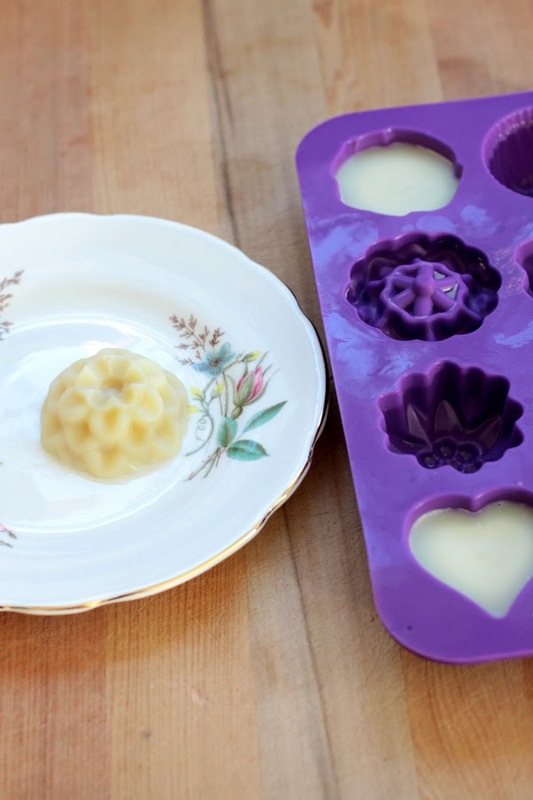 Once set, gently remove from moulds and store in a cool,dry place. Simply drop one or two into a warm bath and enjoy. I usually add a cup or two of epsom salt as well. These can make the bath pretty slippery so please be really careful. 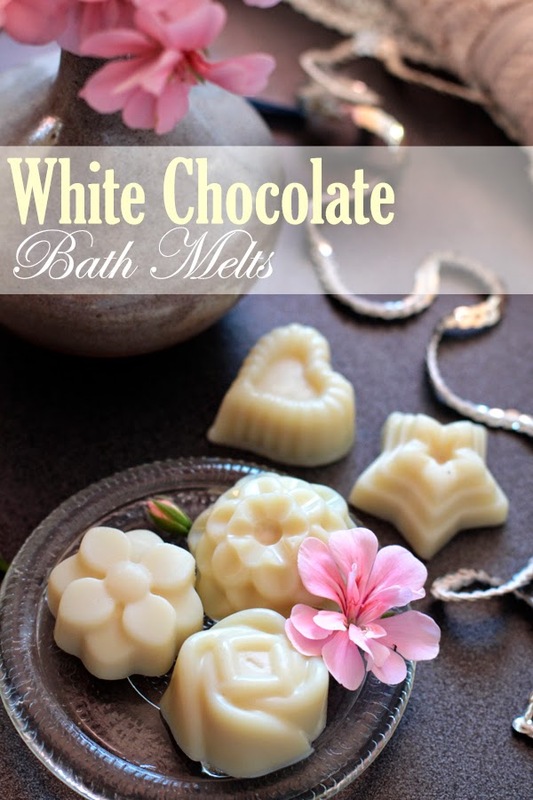 Use a good quality bath mat and add the melts after you’ve gotten into the bath so that you don’t slip getting in. It’s a really good idea to give the bath a quick wipe around after you’ve finished to remove the oil too. I just use a cleaning cloth with some cheap face cleanser or shower gel. Let me know how you like these. What are your favourite additions to a relaxing bath? 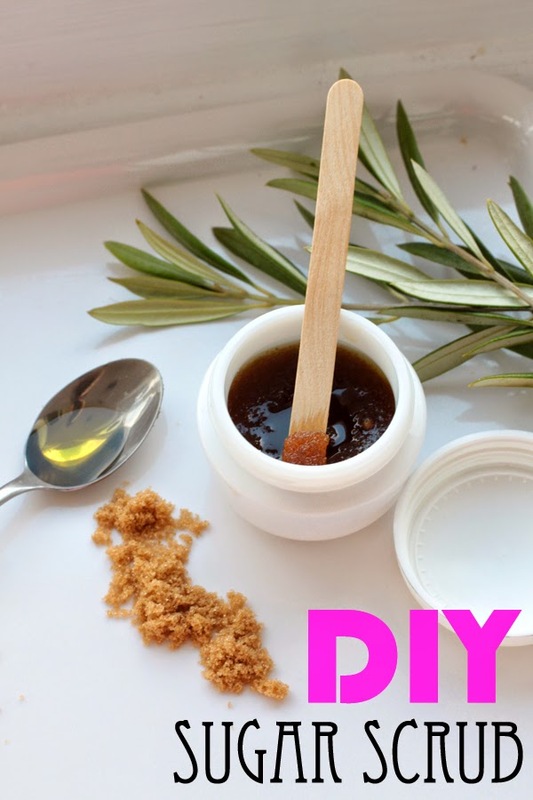 This is a really wonderful recipe for the skin and I find it so much effective than most commercial scrubs. It literally takes a second to make and is also budget friendly too! 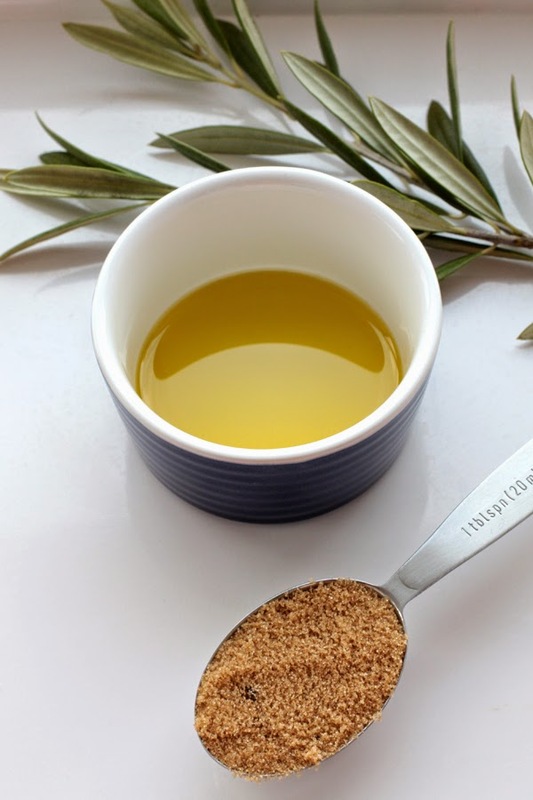 Mix oil, sugar and essential oil (if using) together until combined. Apply to dampened skin then rinse off. Most of the oil will stay on your skin but please be careful in the shower as sometimes the oil can make it very slippery. As this is so quick to make I usually just make enough for each time I need it though rather than making a big batch to keep. Extra Virgin Olive is usually what I’ll use as it is not only the most economical and easy to source, but also really nourishing to dry skin and high in wonderful vitamins (such as vitamin E). I find olive oil a little heavier than some of the other oils so for me it’s best to use on the driest ares on skin such as the feet, hands, knees and elbows. Just be warned some olive oils can have a strong olive smell, sometimes quite fruity, sometimes more peppery, if that bothers you you might prefer some of the other oils (or using Light Olive Oil). Whatever oil you use will stay on and moisturise your skin after you’ve washed the scrub off. A lot of recipes use less oil than I do but I find the scrub too dry otherwise. 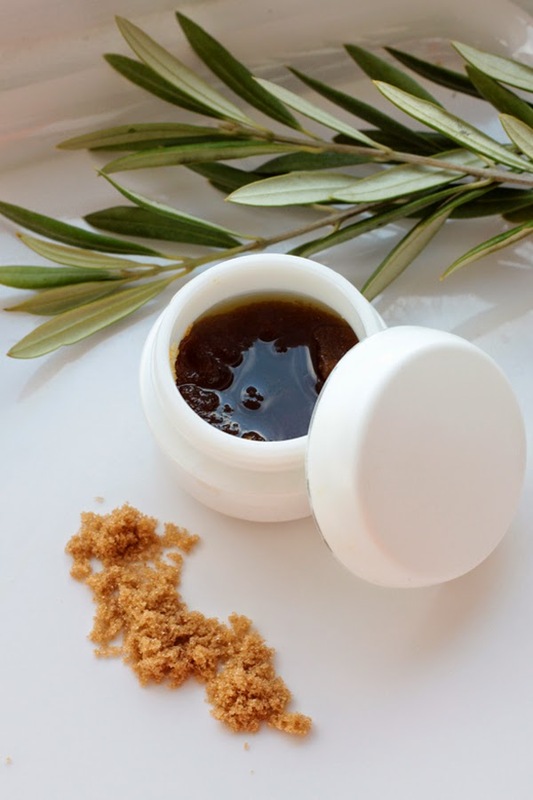 The sugar grains not only mechanically exfoliate dead skin cells but also contain glycolic acid, an AHA (alpha hydroxy acid) that further helps dissolve and break down these cells. Sugar is also hydrating as it draws in moisture from the environment rather than taking it from the skin (like salt does). 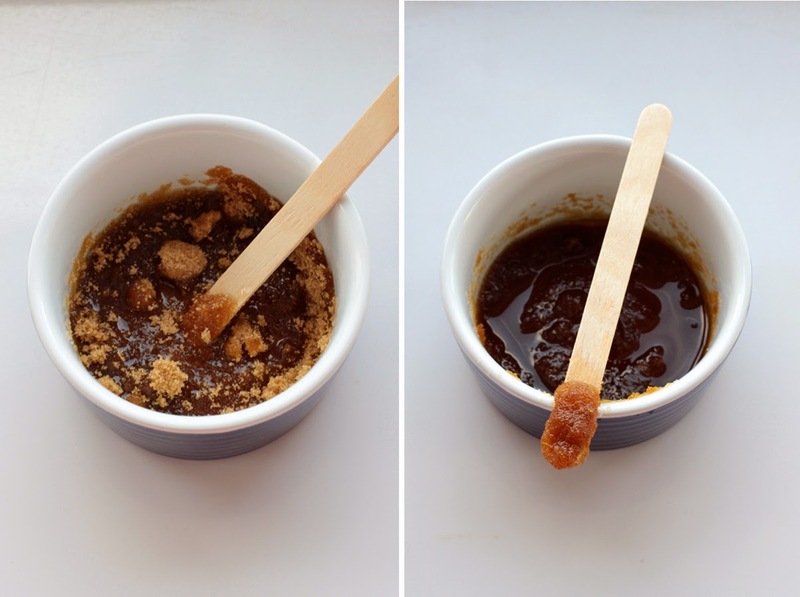 Although eating refined sugar isn’t the best thing for your skin or body, I don’t believe there is any benefit to using healthier unrefined sugars (such as evaporated cane sugar, date sugar, molasses sugar) for this than standard white or brown sugars, so don’t waste those here. I am only starting to learn about essential oils so I don’t have too much information about them yet. Just be warned that essential oils can be quite potent and certain ones quite irritating to the skin. Everyone is different, I know peppermint can be really irritating to a lot of people whereas I find it quite soothing. I hear that there are certain oils that are dangerous when pregnant too so just make sure to do your research. Essential oils can be rather expensive but I’m finding they are much more affordable to buy direct from online soap/cosmetic/candle supply wholesalers. I actually prefer to make most of my cosmetics without fragrance or essential oils so they don’t interfere with my perfume. As I’m someone that’s not overly creative with my hair styling, hair accessories are a great way for me to add a bit of fun to a simple style. I actually wear them a lot at work as I’m required to wear all black but any colour I want in my hair/jewellery! 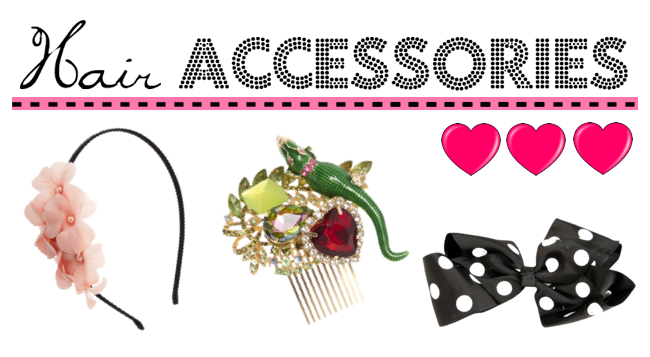 I love looking at online stores just to see the lovely ways they style hair accessories. ASOS is the best for styling hair accessories I would say. I love checking out their site just for ideas alone! Do you like wearing hair accessories?? What sort of style is your favourite? This is an absolutely incredible site. It’s by far the best perfume review/community I’ve come across. They have break downs and member reviews on pretty much any perfume you can think of as well as lots of great articles and information to help you understand everything perfume related. You are given recommendations based on what other members like, the season, time of day, similar scents etc. I’ve already spent so much time on this site and there still seems to be so much good information here I’m yet to discover. The forum on this site is really great too and members are more than happy to help recommend you some new perfumes to try. Perfume expert Katie Puckrick’s Channel on Youtube is both incredibly helpful and really entertaining. She does lots of nice, short and sharp reviews on some of the most famous fragrances and has lots of tip and collection based videos too. I’ve gotten so much out of watching her videos lately. They’ve provided a great introduction for me to a range of different scents. I highly recommend checking out her web app too – Fume Finder. Here she lists her favourite scents categorised by season, style, ingredient and more. I’ve discovered lots of lovely new perfumes through here too. And don’t forget to check out her blog! It’s rather difficult to get mini sample vials here in Australia and I’m someone that really has to try out a perfume a number of times before I get an idea of how much I like it/or will wear it. I’ve come across two websites that look really great for purchasing sample vials. This site is amazing!!! They actually produce the vials themselves so you can choose from a 1ml up to a 15ml (depending on the scent). My favourite thing about this site is that they produce vial sampler sets of about 8 different scents based on perfumes notes/categories, colour, periods in history, seasons, award winners and popularity for example. There are so many perfumes to choose from it’s actually rather overwhelming. They seem to ship to a lot of countries too, including Australia. Sets start from about $25 for 8 x 1ml vials. Single vials are start from about $3. I also find it really helpful to look through the lists of sample sets to get an idea of some perfumes I might like to try. I am thinking of purchasing one of the Introductory Oriental Vanilla or Floral Sets – If I get this I’ll let you know how I go. I can’t actually find the sample/vial page now (if there was one??) but if you search for a scent you’re interested in there are usually samples available from $3 to $6. 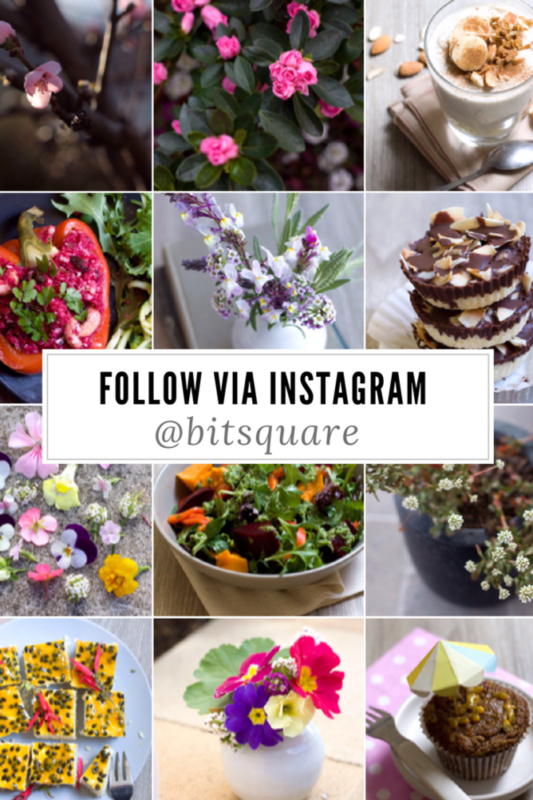 I don’t have any personal experience from here but it looks really great – they also sell makeup and skincare too. Also, at the moment Sephora has the most amazing gift set – Fragrance Sample For Her. It comes with 14 samples of some of their most popular perfumes plus a voucher for a full size bottle of your favourite scent. I really wish this was available here in Australia. It would be such a great gift for someone starting out with perfume. I really love checking out the mini perfume gift sets that come out around christmas and then are on sale this time of year. As mentioned above, perfume is something I find really difficult to know how much I like it until I actually start wearing it – sure there are perfumes I know I either love or hate straight away – but others are much more dependant on my mood. This is the same sort of idea as with samples but instead of investing in a large bottle of a new scent, see if it available as a Roller Ball or within a Mini Gift Set first. I love getting these as they really give you a great chance to try out many different scents and also have lots of options on hand for different occasions. Most major perfume brands have them. They usually come with 4-5 little 1oz bottles and retail for around $50 US. I think it’s good to be sure you like at least 2-3 in the set before you buy it. It’s fun to see which perfumes you end up using. 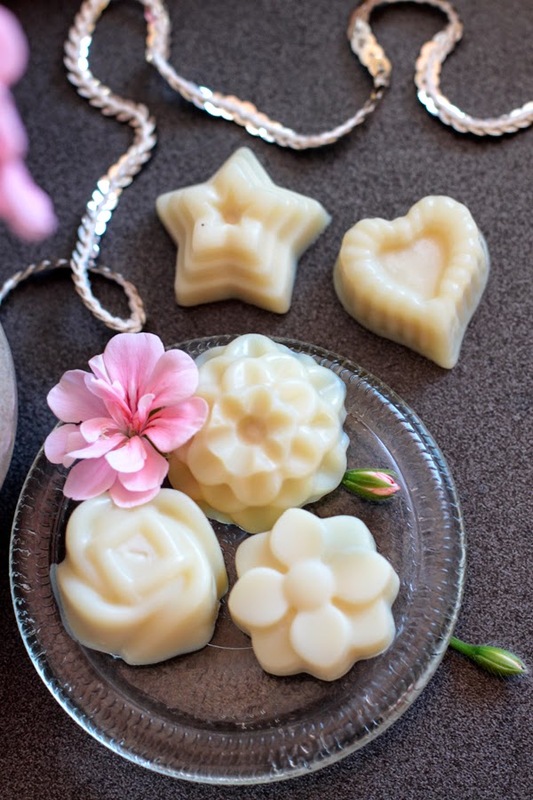 They are absolutely perfect for those just starting out with perfume. There are a lot of these sets brought out at Christmas time and are especially great to pick up now as many are on sale. These are just a bit of fun. They sort of worked on me as I liked the perfumes they recommended. You can find plenty more by googling ‘perfume quiz’ ‘perfume personality’ ‘fragrance quiz’ or something like that. Hope these are of some help! 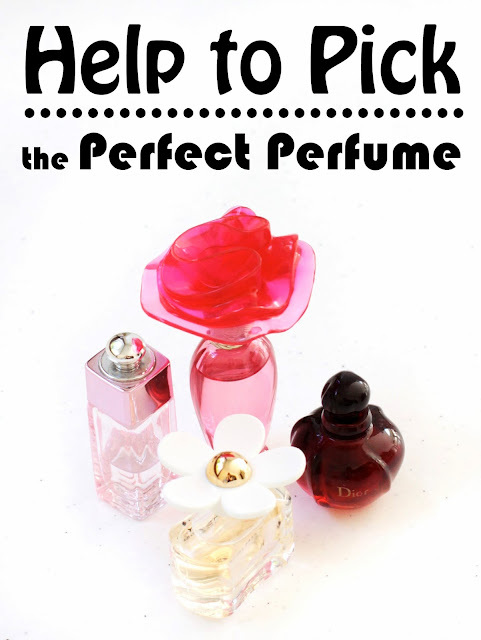 What are currently your favourite perfumes?? How do you discover new scents to try?? ?